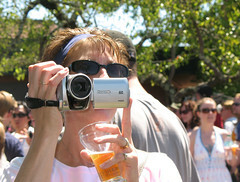 Beerfest in Sonoma and the Bay Area Beer Bloggers launch! A weekend spent in the heart of wine country, a festival… a long bike ride along country roads… and not a drop of wine. It’s not that we don’t like wine, or that we don’t know the quality of Sonoma’s wines, it’s just that we were saving ourselves for the world class beers of Sonoma. 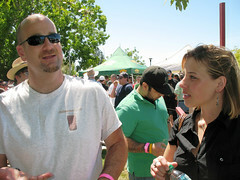 Thanks to the networking inclinations of the extraordinarily prolific and dialed-in Jay Brooks, the Beerfest in Sonoma was the second meeting of BABB, the (happily babbling?) Bay Area Beer Bloggers. We had the pleasure of driving up with JJ the Thirsty Hopster, running into Jay Brooks upon arrival and then meeting Meredith and Chris who do thebeergeek.com and who are on an epic international beer tour this year which thankfully included this Beerfest in Sonoma. It was great meeting them. For one thing, they share an interest in vegetarian food-beer pairings, another area where the beer culture revolution has plenty of room to make progress. We hung in the shade, and talked about all kinds of beer miscellany and unrelated miscellany. We tried some lovely beers, including a delicious stout from Bear Republic, two remarkable redwood beers from Brian Hunt’s Moonlight brewing, and a delicate floral spice Italian brew from Russian River Brewing that we’d tried previously at the Raley Field festival in Sacramento. Everybody took some snapshots. Later we ate at Santa Rosa’s 3rd Street Alehouse, and were delighted by a rich robust porter there. The following day we took a lovely bike ride west out of the town of Healdsburg, enjoyed the richly aromatic countryside, (floral! resinous! earthy! ooh, barnyard!) passed by notable wineries, drank water, and eventually returned to Bear Republic for dinner and then to Russian River Brewpub for…ummm…dessert, Belgian style. Just one of the pleasing beer tourism moments at Russian River was seeing someone from LA arrive with six Russian River growlers to be refilled for his coworkers down south. Sonoma County, you got something going on. It’s possible to take a bus from San Francisco to within a few blocks of Russian River Brewing, nearby Third Street Alehouse and Flavors, a restaurant that serves Moonlight beers. After this weekend we’ve vowed to write all of that up, as soon as we decide where it goes in the site architecture.